May 21, 2012, 10 a.m. 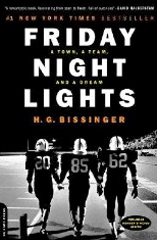 The Friday Night Lights author reflects on how newspapers have changed, why editors need to take risks, and the sale of Philadelphia’s two largest newspapers. By Adrienne LaFrance @adriennelaf May 21, 2012, 10 a.m.
Reporter, author, and former Nieman Fellow Buzz Bissinger stopped by the Nieman Foundation last week and shared his thoughts about how journalism has changed since his early days, and where it’s going, among other topics. Here’s a partial transcript from Bissinger’s visit. I knew Rendell, and I knew the team he had put together, and I thought it would be a blithering disaster far beyond what other papers have had to do. I mean, I understand developers have bought papers, and Warren Buffett bought a paper…[With Rendell] you have a former governor, mayor, arguably the most powerful person in the state — and I’m not saying this to be facetious, probably was [the most important person] since Joe Paterno had died — running a paper, making editorial policy. And not only that. It wasn’t simply a matter of what Ed decided to do, it would be the thousands of people who would call Ed, every f—king day, because they would hear a rumor — and I know Ed, he would be very susceptible, sometimes out of kindness sometimes out of whatever, protecting someone, and I just felt the influence he would have had over the paper…it would be a disaster. This was the worst-case scenario of a paper being taken over. It would be local leadership, but you could not have a former governor or mayor running a paper. So I wrote [the op-ed], so reaction was predictable. Journalists loved it. I understood that…I actually think it did have something to do with it because increasingly there was increasing criticism and Rendell actually dropped out. I think he realized that this was just going to be a can of worms that he did not want to get involved in. Every day, someone would be saying the coverage had been be slanted one way or the other by Rendell’s influence. The consortium that bought it does include George Norcross, who’s a very powerful politician, and [former New Jersey Nets owner] Lewis Katz, who I’ve never really trusted. Norcross did do something that I actually did admire. He wrote a sort of public letter and signed it, and said I will not in any way influence coverage of the paper whether it involves me, any of my companies, or any of my family. And if he sticks to that, you know, I think that’s good. So right now you can’t really tell. They brought back Bill Marimow as the editor. Bill is a wonderful editor. Whether or not Bill is right — because Bill is very old-fashioned and papers are changing, papers need to change — and whether that type of old-fashioned editor is good for the paper, I don’t know. What was great about journalism when I entered it — it was literally, really, right after Watergate, it was 1976 — papers were hot. Papers were making money. But beyond that, they all wanted investigative reporting. They all wanted long-form reporting. So when I was at the Norfolk Ledger Star, I was doing 125-inch stories as a kid reporter. Even there, I began to learn narrative, how to tell a story. When I went to the St. Paul Pioneer Press, I wrote 35,000-word stories. You know, seven full pages in the paper. So even before [working at the Philadelphia] Inquirer, the tools of interviewing, the tools of developing character, the tools of telling a story, the tools of drawing the reader in were things that, you know, I had already learned. They were certainly honed at the Inquirer, which gave a tremendous amount of time to stories. And also by the stimulation, which for me was good and bad, of being around other reporters, who really were superb. [Former Philadelphia Inquirer Editor] Gene Roberts is a complex man, and he was great at the Inquirer. He wasn’t so great at The New York Times. He did [say], and it’s a nice aphorism but I think it’s true, which is the key to reporting is to zig while everyone else zags. I was never an expert but I don’t follow newspapers as closely. I think, and this is a generalization, I think the writing is not very good a lot of the times. A lot of it is fewer copy editors, fewer editors, the 24-hour cycle which I never had to deal with. You’re writing for the web, you’re writing for this, you’re writing for that, you’re updating here, you’re updating there. So I think the writing has really gone down, and that was one thing that was really coveted at the Inquirer. Are papers — some papers — still doing good investigative reporting? I think that’s the case. But they just, papers don’t have the same relevance. Of course neither do books. Neither do magazines. I don’t really know where we are headed. The book businesses — every portion of the printed word is in turmoil. News holes are getting smaller and smaller and smaller. But you know what, a lot of good things are still being done. And I think it all depends still on the editor. Newspaper editors are very cautious — too cautious. One of the things that I don’t miss about papers is the constant — as it goes up the food chain, one editor after another, after another, after another, and what happens is it loses its voice. Everyone takes a shot at it. It’s like making a bad movie. I think it’s better if you just stick with one editor. But none of us know what the future is going to be. I still think papers can be great places to work at. They’re different beasts now but you know what, you’re in good company or bad company. So are magazines. I write for Vanity Fair which doesn’t have nearly the buzz that it once had. You almost never hear anything about it anymore…These are scary times. I can’t predict. Papers have to think out of the box. It’s hard for journalists to think out of the box. One of the reasons I left print journalism was because I got a little bit bored of being reined in. But they have to — and they still may fail — but they have to. What I worry about the most is — because there’s been so much negative that’s been written — that readers have just said, ‘Well, f—k it. They’re dead.’ And I’ll tell you, if they die, our world will be a hell of a lot different. A hell of a lot different. We’ll have no news. You know, we’ll have these little websites, but we’ll have no news, and we’ll have no vigilance, and we’ll have no reporting of any kind, and it will be f—king chaos. That’s just more than a tragedy. That’s a social disaster. POSTED May 21, 2012, 10 a.m.
LaFrance, Adrienne. "Buzz Bissinger: Newspaper editors are “very cautious — too cautious”." Nieman Journalism Lab. Nieman Foundation for Journalism at Harvard, 21 May. 2012. Web. 18 Apr. 2019. LaFrance, Adrienne. "Buzz Bissinger: Newspaper editors are “very cautious — too cautious”." Nieman Journalism Lab. Last modified May 21, 2012. Accessed April 18, 2019. https://www.niemanlab.org/2012/05/buzz-bissinger-newspaper-editors-are-very-cautious-too-cautious/.